The US has agreed a deal with Romania to use an air base there as a transit point for American forces leaving Afghanistan, officials have said. The agreement was reached at bilateral talks at the Pentagon. 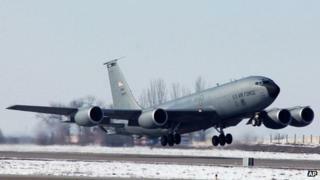 The move will allow the US to switch its flight operations to Romania from Kyrgyzstan's Manas air base, when the US lease there expires in July 2014. Washington plans to withdraw most of its 52,000 troops from Afghanistan by the end of 2014. The US wants to keep a smaller force in the country after the deadline, but is still negotiating key details with the government in Kabul. The deal about the use of Romania's Mihail Kogalniceanu air base was agreed during the talks between US Secretary of Defence Chuck Hagel and Romanian Defence Minister Mircea Dusa. In a statement, Pentagon spokesman George Little said Mr Hagel "praised this agreement, which is particularly important as the US prepares to wind down transit centre operations at Manas". "Secretary Hagel highlighted this agreement as a further testament to Romania's steadfast commitment to the Isaf (International Security Assistance Force) mission and its commitment to regional and international security." However, the details of the deal were not released. The base is near the Black Sea town of Constanta. In June, Kyrgyzstan's parliament voted to end the US lease on Manas in July 2014. The US pays $60m (£39m) each year to lease the base, which has been in operation since 2001. Russia also has an air base in Kyrgyzstan, for which it agreed a 15-year extension last year.